In Tai Chi, we learn to focus on the empty space above our head. We learn to be in the state where our focus is in the area above our head, where our head is pulled upward as if suspended by a string. This is known as the Suspended Focus State ("虚領狀態"). When we are at the Suspended Focus State, the point in which we focus our thoughts is also located on the Stable Line of Gravity. The Suspended Focus State is useful in lessening the interference to our body from our Fixation and our Ego (i.e. our Fixations and our Ego are sources of interference, introducing tension to our body). We try to focus our mind (which identifies with our Ego) onto a place outside our bodies. 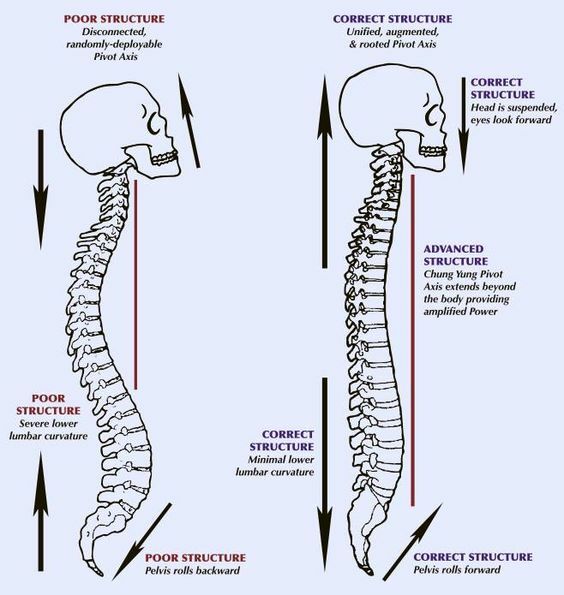 When we are in the Suspended Focus State, our posture naturally corrects itself. As we are in the Suspended Focus State, become the watcher of our mind. Don't judge, just watch. Be the watcher of our thoughts. Be the watcher of your body, and what it is telling you. Be present. Also, pay attention to the silence. Outer stillness brings inner stillness.